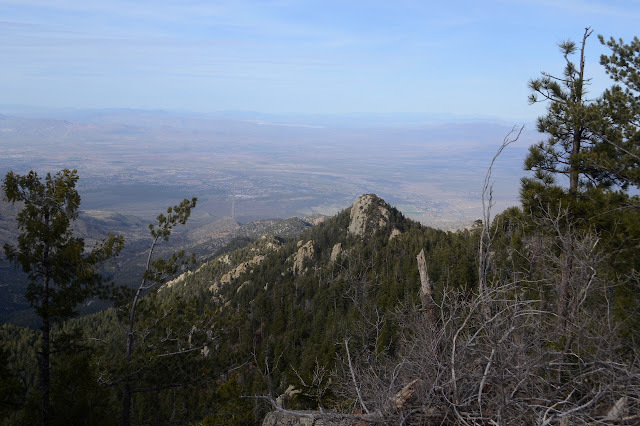 With a little bit of time and having been able to download information for the local geocaches, I decided to pop up Ladybug Peak again, this time the very easy way. 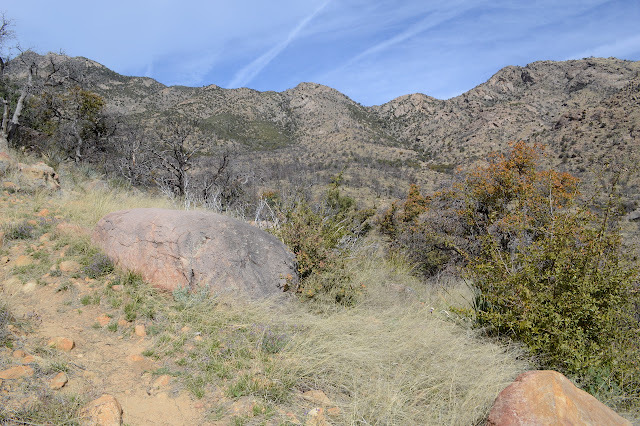 The road passes through a saddle just below it and Bear Canyon Trail climbs just half a mile to its top from there. I missed three geocaches because I hadn't downloaded them prior to coming to the forest, but one is on the top. Admittedly, it looks like I should have found it while I was looking for the register, but it is so short that I may as well go for it. And I have this feeling I'll finish Ladybug Trail although I actually already did that when I got to where it ends in Bear Canyon Trail. This end of the trail has one of these fancy kiosks with a map. Turkey Flat Trail is shown on it, but not as a path. Heliograph is also shown as a path. So the person tracing out the trails knew a bit more of them than the maps they were tracing. The trail climbs to what looks like a junction in just a few feet. All signs point right, so whatever continues left is unknown. One sign says 6.5 to Angle Orchard, which I think is more correct than the 6 it claims at the other end. The other, newer, one says 6.0 to highway 266, which is another 1/4 mile further than the orchard, so even more wrong. It makes no difference to me today since I am just popping up to the peak. The geocache description warns about the next switchback where people have missed. All the switchbacks here in the forest have animal trails going off the end as one might expect, but this one now has quite a pile of debris purposely placed on the end, so there might have been some problems with it. I wind upward. Taking the easy way means quickly getting some easy view. 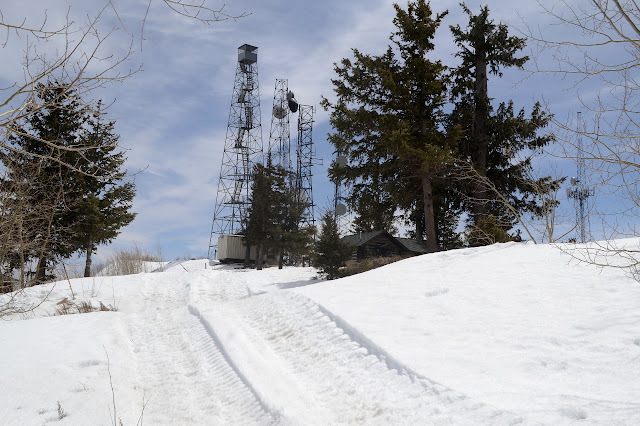 There is both trail and road up Heliograph Peak. 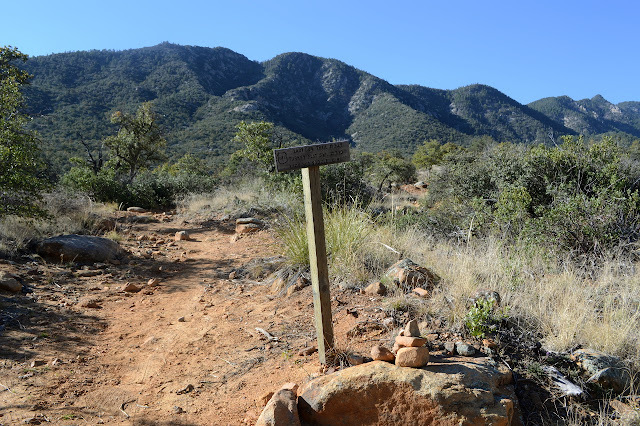 The trail climbs up from Arcadia National Recreation Trail near Eagle Rock, not that it can be found on the National Forest quad. 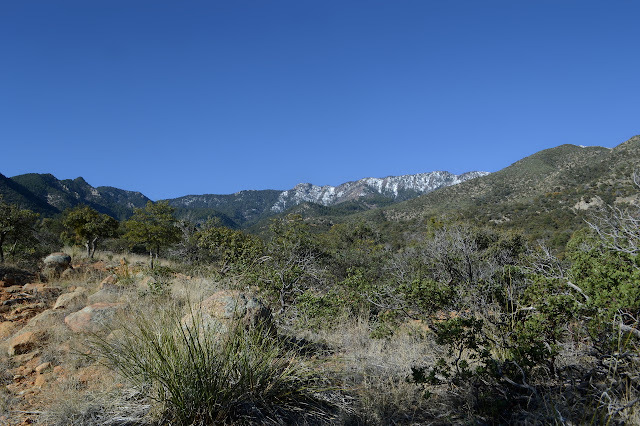 My initial plan was to start at the lower end of the trail at Upper Arcadia, but got lazy or loop happy and am at the upper end at Shannon Campground. The campground itself if actually locked up tight and under a blanket of snow, but there is parking a few feet up the road to Heliograph Peak, which is next door and also locked tight. I could bring my snowshoes for the snow, but have decided to go with the easier to carry rubber and chain "crampons" since it is a bit compacted and I am lighter without big pack and cat. They actually say "crampons" on them, but are more like spikey tire chains for my feet. They are too big for any of my shoes except my boots, so that is what I am wearing. Anyway, it seems like the right environment for waterproof boots. I can't get the debris baskets off my poles, so no snow baskets for me. Once sorted, it's down the campground road hoping the trailhead isn't under too much snow to see. The entry to Shannon Campground but none shall pass this early in the year. My start is hailed by a chittering squirrel with a decidedly red tinge to its underbelly. One of these rare red squirrels? A sign along the way says Rumex is a rare rhubarb relative that thrives in the local riparian areas and asks if I can find it. Not yet, but the stream is running, so that is probably the riparian area where one should look eventually. Halfway through the camp is the trail. The kiosk seems to have melted the snow around it, so it is not too hard to find. Found the trailhead easily enough. The sign assures me it is only 2 miles to Heliograph Lookout although that is not actually a destination along this trail. 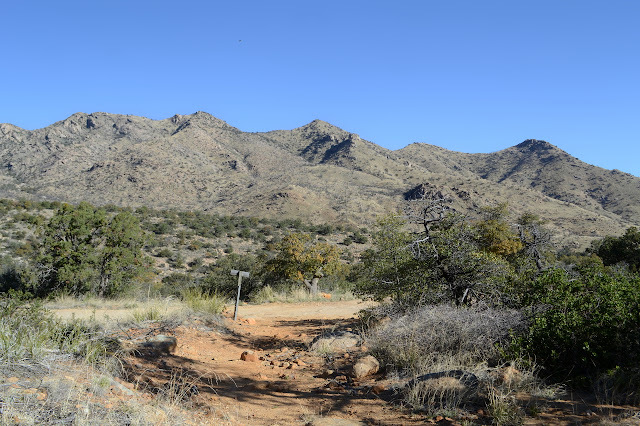 Noon Creek Ridge Trail is in 3 miles and Arcadia Campground is in 5 miles. It would have been about 5 miles from the bottom trailhead to the peak, so 10 miles round trip instead of 4. Now the challenge is to find the trail. 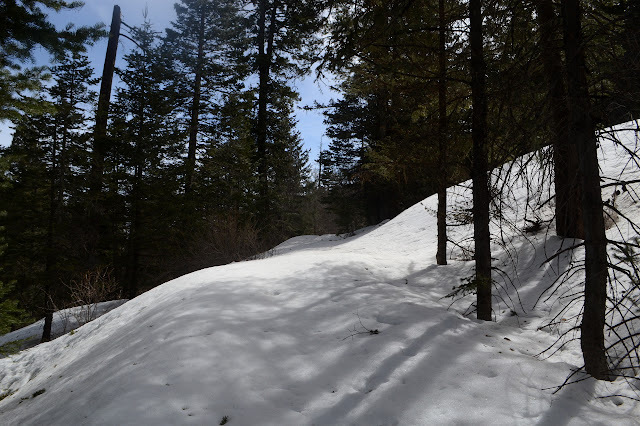 It seems to be along an old road which shows up as a wide flat strip on the snow covered hill side. A few trees have come down over the winter and maintenance, if it comes, is still at least a few weeks off. A lot of them are still green. Easy enough to spot the old bit of road the trail follows here. 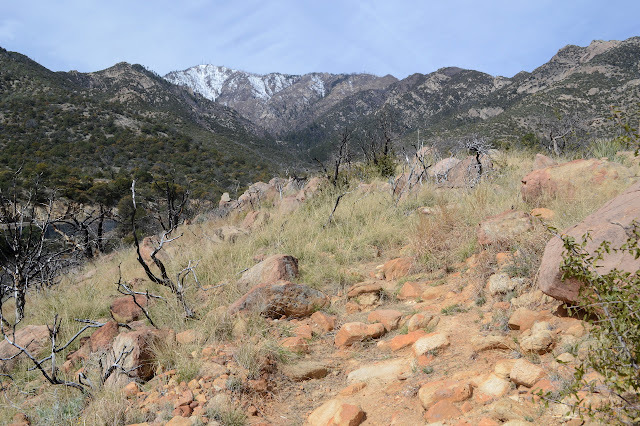 I want to go up Mount Graham and I want to do it right with some climb involved. It has 6300 feet of prominence, after all, and one should honor that. 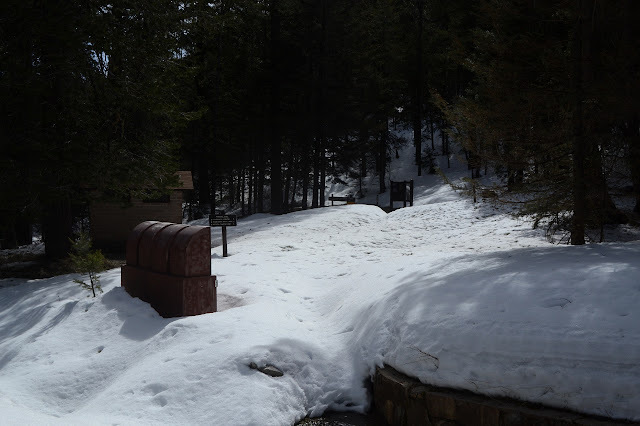 The sign at Round the Mountain Trailhead, the old summer CCC camp, says 17 miles to Columbine, the old winter CCC camp. I want to break off just short of that to take Deadman Highline Trail further up and across to finish coming down Noon Creek Ridge. I figure it for about 35 miles, which is too much for a day. That means Timmy, the cat, has to come with me, with all his limitations. He did a 5 mile day, hopefully he can do 7 mile days. That really slows me down to 5 days from probably 3 days. The big beautiful new kiosk at the trail says food has to be in the car or hanging in trees. I expect the bear canister is also okay and there do not look to be too many trees suitable for hanging food even where it hasn't burned, so that has to come. Oh, and there is snow up there and I got me some snowshoes, so those go too. The whole enterprise is almost certainly doomed to failure, but at least it won't be for lack of having an obviously necessary bit of equipment. There is a shorter loop heading up Gibson Creek after 5 miles, but I feel like when I fail, (er, "if", if you please) I'd rather have done as much Round the Mountain as I can. Note: I hear rumors and innuendo about hiking in the "Red Squirrel Refugium Area" up at the top of the mountain. It says on OpenStreetMaps that all entry is forbidden, but there is an international observatory at the top and even if that thing is automated (as the winters here would certainly encourage) it still needs some maintenance, so that is obviously untrue. 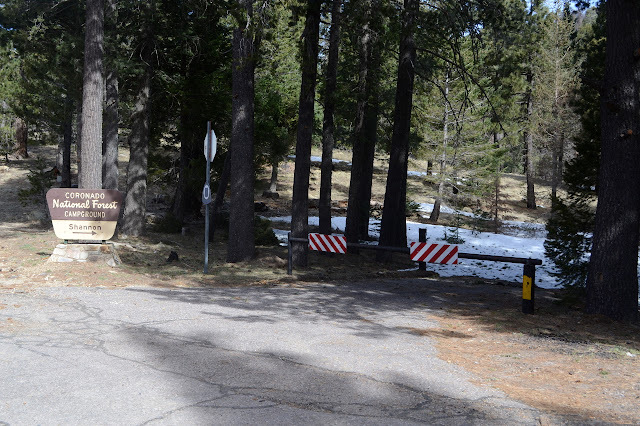 The Forest Service quad shows it, with very different boundaries, but does not contain the words "no public entry" as is common when public entry is not allowed, nor anything similar. 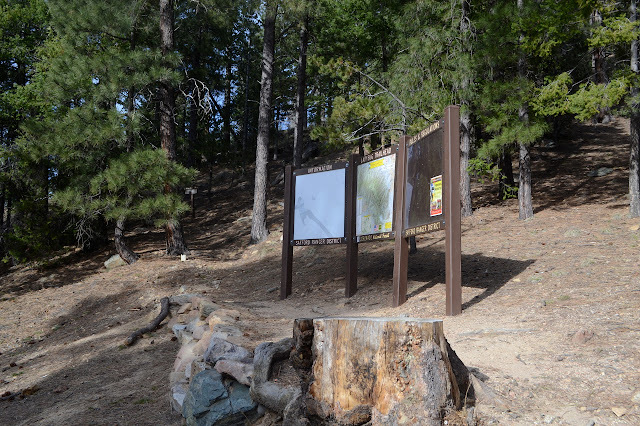 I am looking at a shiny new kiosk with lots of room for more information at a trailhead that intersects a trail going to the top of the mountain in 5 miles, it certainly seems like the place to have information like that. It has a map that does not show the refugium at all, but does carefully highlight those trails within it as part of the "trail system". This rather strongly indicates hiking is legal. 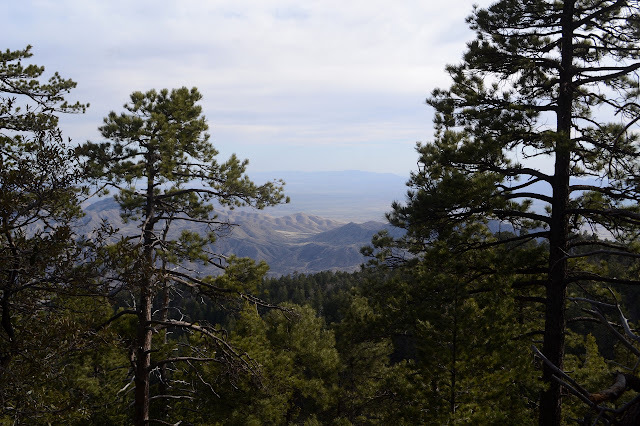 I will also enter the "Mount Graham Wilderness Study Area" in 2 miles. I don't know what a wilderness study area is, but there is noting to indicate it has the regulations typical of a wilderness. It's possible someone put the least amount of thought possible into the information presented here. There is a notice that pets should be on leash, which he is. 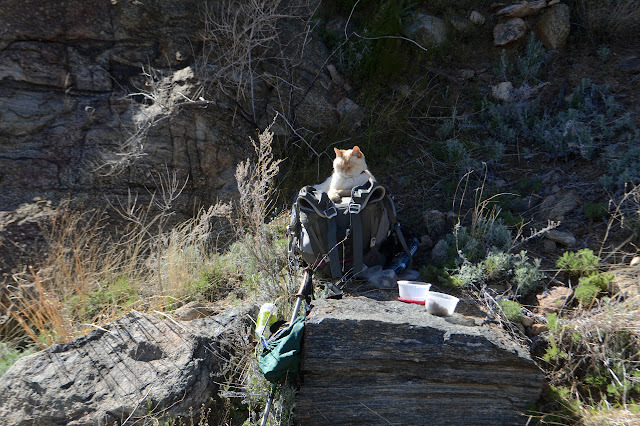 So I am off with my somewhat heavy pack and my handful of a leashed old man cat, down the steep path and over the creek. Oh, dear, why did I pack the hammock piece for carrying him? I knew he would need carried soon. He is not keen on getting carried across the creek, but I am pretty sure he would get even more unhappy if he got down in the middle, so I hang on while hoping the two big loose rocks along the way don't roll under me too badly when I step on them. He can walk again for the bit along the creek and the climb up into the burn. Very slowly. Looking down the valley, the burned south facing slope is quite distinct from the creek area and the north facing slope, but then it usually would be. The trail and its destination, at least within what is visible from here. It goes up through the low spot on the ridge. A lot of the trees that burned died outright instead of regrowing from their roots here. Some have managed to preserve a little. Maybe these oaks do not have that ability. I want to stop hourly to give Timmy a chance to eat and drink. Hydration is important for him too, and he doesn't have a drink tube like I do. The first hour comes a lot closer to the trailhead than I was hoping. I started late and now I am even later if I really want to finish off 7 miles today. At least I can get out the carry sling that shouldn't have been packed. Up ahead, Heliograph Peak. It is a 10k foot peak a little shorter than Mount Graham. 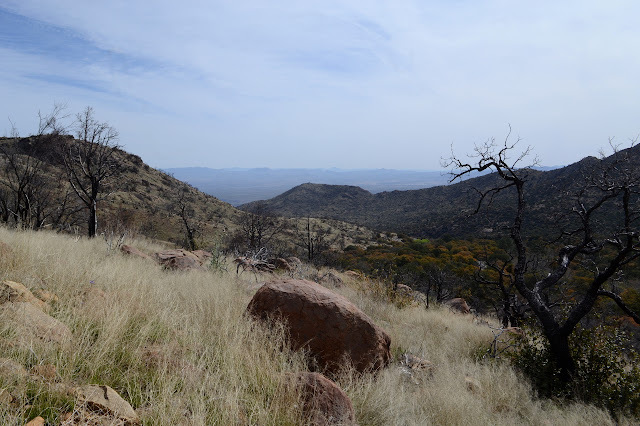 Well, I said quite some time back that I was going to Coronado National Forest and now I finally got to a little bit of it. I saw it for all its high prominence peaks. It is a forest made of many separate pieces centered on "sky islands", mountains that stick up significantly from the surrounding terrain such that the tops have vastly different (and often unique, like islands) flora and fauna. It's a more poetic way of saying the same thing. 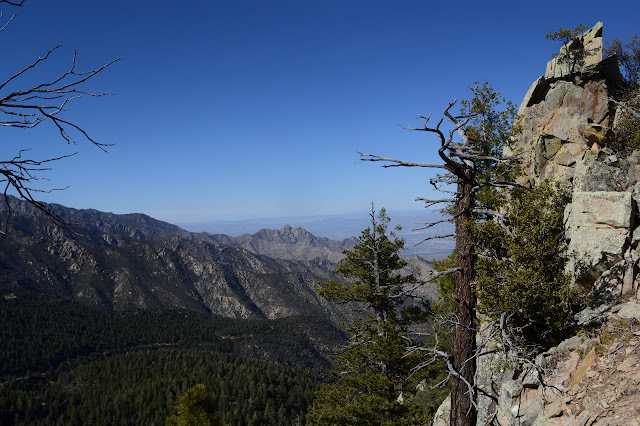 This particular sky island is the Pinaleno Mountains and the high point, Mount Graham, stands over 10k feet on a desert floor of about 4k feet. I figure a good get-to-know-the-place hike will be the Ladybug Trail. It runs through a bit of elevation without getting into too much snow, will let me get a better look at the higher elevations, and there is even a peak to grab at the end. Also, unlike a few other trails in the area, most of it didn't just burn in the 2017 Frye Fire. Sign just before the gate for Angle Orchard to mark the start of the trail. Lady Bug Trail #329. Turkey Flat 5 mi #330. Lady Bug Saddle 6 mi. There is snow above. Ladybug Saddle is the dip toward the left and Ladybug Peak is the round just past the pointy peak even more left. The ridges to the north burned although some of the difference is south facing vs. north facing. The trail starts up a fuel break, then a sign points down the hill. It goes steeply down, over the orchard water supply, and across Jacobson Creek, which is running pretty well. 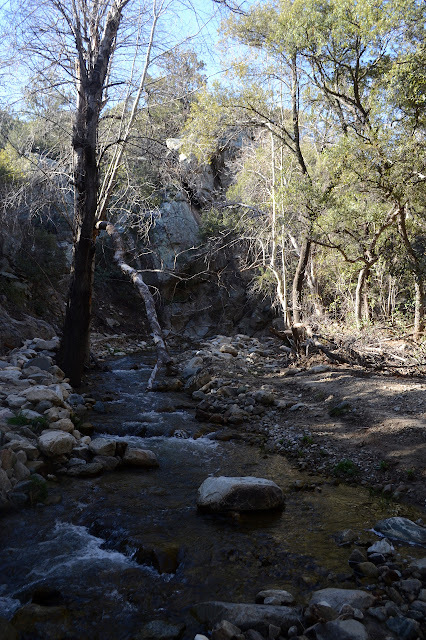 A waterfall flowing into it catches my eye, then there is a general wondering where the trail is going. Someone put a big cairn below it a little before it reaches the creek and there is a general flattening of the dirt going upstream. On the other side, there is not a lot of room for anyone to be until a little downstream, where, ah yes, the trail does continue right across the bottom of the waterfall. That explains the big cairn, which is directly across from it. The only dry foot crossing looks to be on a log which is wide and flat enough to feel safe on this side, but gets a bit narrow by the end. Being already on top, it is easy enough, but getting up onto it in a balanced way for the return looks like it will be difficult. Not something to worry about yet, as I jump down and start climbing. Jacobson Creek is running well and with no place to hop rocks.